1973-74 Topps card #151 – Phil Roberto Most hockey card photography from the late 1960s and early 1970s consisted of either portraits or posed shots. By the mid-70s, Topps and O-Pee-Chee started to use game action photography. And nothing says ACTION like two hockey players fighting. 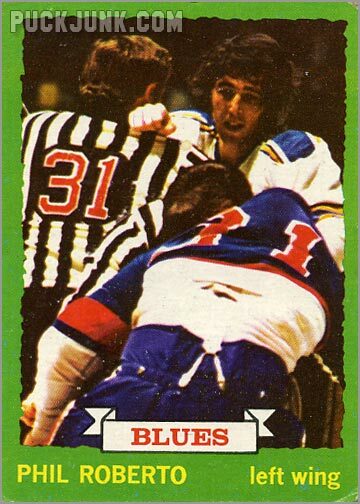 Phil Roberto, of the St. Louis Blues, is shown … Continue reading "Fight Card"